He's been nominated for two Oscars, had a pretty successful music career, and was even a Calvin Klein model. He's very talented. And this is me, Spencer. I've never been nominated for anything. Mark Wahlberg recently posted his daily schedule on Instagram, and the Internet started to freak out because of how ridiculous it was. I mean, he literally wakes up at 2:30 a.m. every single day! His schedule made my jaw drop. I thought to myself, "What kind of person would willingly torture themself like this?" And then I realized exactly the kind of person who would do that: me. That's right. I decided to live like Mark Wahlberg for 24 hours, all without trying to die. Here's what happened. My alarm went off at 2:30 a.m., and my first thought was literally, "Why did I do this? This is so stupid." I'm 100% a morning person. I'm always up by 6 a.m., whether my alarm goes off or not, but purposefully waking up at 2:30 seemed ridiculous to me. That's just too early. I probably got about four hours of sleep, so when my alarm went off it felt like I was harshly woken up from a nap. I was not off to a good start. I've never prayed before, so this whole experience was new to me. I never learned how to pray, and I think I would have felt weird doing it for this project, like I was a fraud or something. I don't know if I believe in a proper god, but I do think Oprah comes pretty close to that standard, so I decided to watch some of her videos instead. There's one video in particular that I've seen hundreds of times and can probably repeat verbatim, where she talks about surrendering. This exchange felt like a fair tradeoff. Also, I was confused as to why Mark Wahlberg prays at the start of every morning. I feel like he could pray before going to bed instead, which would give him an extra 30 minutes of sleep. 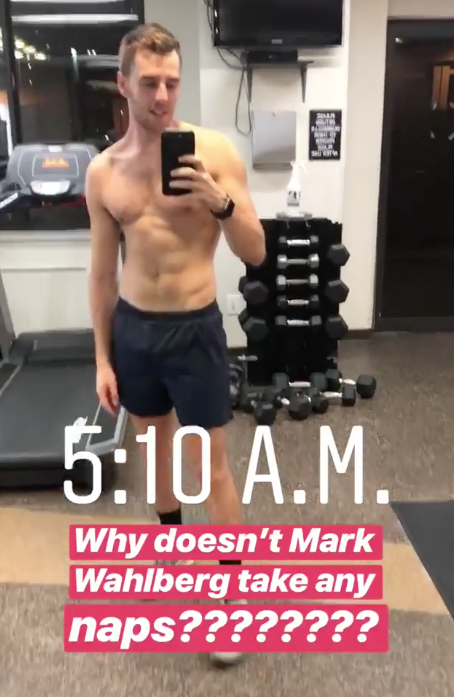 There are actually a few similarities between my schedule and Mark Wahlberg's – like working out in the morning – and I think they made the project a little easier for me than they would for other people. I had my usual pre-workout meal (a protein shake + bar) while I watched another Oprah video. This time I turned off the lights so I could sit in the dark and question all of my life choices that brought me to this exact moment. My body was not ready to be fully awake yet. Being awake this early was actually kind of creepy. I hadn't seen a single person yet, and very few cars were out in the normally-busy New York streets. 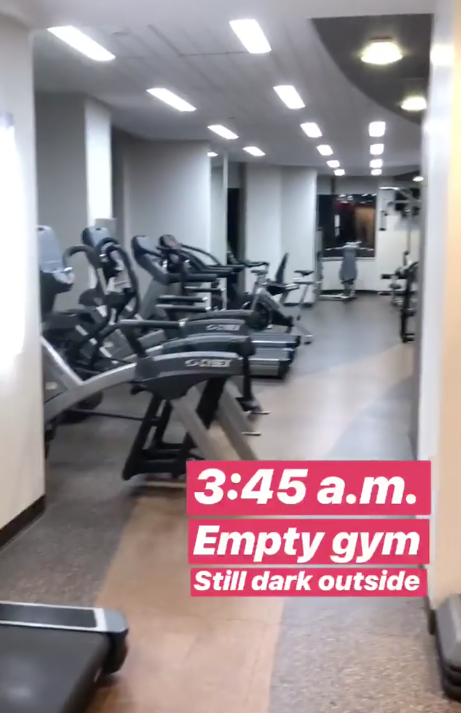 The only good thing about being in the gym at 3:45 a.m. is that it's completely empty. I forgot my headphones in my apartment, so the empty gym actually worked out perfectly because I could play my music directly from my phone without having to worry about bothering anyone. I kept thinking that people would start to come into the gym as I finished my workout, but I never saw anyone. That's how freaking early I was there. Note to self: Nothing is louder than a microwave when you're trying to be quiet. I always have oatmeal with a little honey as my post-workout snack. I needed a microwave to cook my oatmeal, but I completely underestimated how loud it was going to be. Like, it's not normally THAT loud, but at 5:30 a.m. when you're trying to not wake up your roommate, it sounds like an 18-wheeler that's driving through your kitchen. Mark Wahlberg's schedule says that he showers for 90 minutes. I did not follow this part of the schedule. Maybe he wasn't being as clear in his schedule as he thought, but it looks like Mark Wahlberg showers from 6–7:30 in the morning. I have to pay for the water in my apartment, and I don't make anything close to what Mark Wahlberg makes (unfortunately), so I took a pretty quick shower. Mark Wahlberg's schedule definitely doesn't account for travel time. I live in New York City, which means I rely on the subway system to get me everywhere. Unfortunately, the subway is often unpredictable, so I need to give myself enough travel time to get to my destination in fear of being late. This is something that Mark Wahlberg probably doesn't have to worry about, and that makes me very jealous. Also, it was pretty cool to be on the subway and see so many morning commuters who were just starting their day, since I had already been up for so long and done so much. I quickly learned that I have no idea how to properly hit a golf ball. When I was younger, my dad would take my twin and me to the driving range in our hometown, and he'd teach us how to hold the club and everything. That was a longggggg time ago, and as you can see I forgot pretty much everything he taught me. Even though I was absolutely terrible at it, hitting golf balls at Chelsea Piers was actually a lot of fun. It was something I wouldn't normally do, and it was kind of nice to swing at something as hard as I could. I started to feel like that woman in Mean Girls who saw Cady Heron wearing army pants and flip flops, so she bought army pants and flip flops. I ate my snack and then went back to hitting golf balls. After about 160 swings I was definitely starting to feel it in my neck (I probably should have Googled "How to hit a golf ball" beforehand, to help avoid injury), but luckily my next stop was cryotherapy, which helps with sports recovery. Spending time in the cryo chamber was one of the weirdest, coolest things I've ever done. But it was (obviously) very cold!!! I was so happy when I looked at Mark Wahlberg's schedule and saw that he did cryotherapy. I've always wanted to do this, but I was also kind of terrified. One of my coworkers told me that she only lasted about one minute in a cryo chamber when she did it, so I was convinced that I wouldn't be able to handle it. I was in there for three minutes and made it through the whole treatment, where my skin was exposed to a dry cold of –220ºF. I was shivering during the whole process and had goosebumps for several minutes after, but I weirdly liked it. Special thanks to NYC Cryo for giving me my first cryotherapy experience! I wanted nothing more than to eat a burger and fries, but Mark Wahlberg's schedule wouldn't let me. I got to the BuzzFeed office for work at 10 a.m. and blankly stared at my computer screen for a few minutes. I was getting more and more frustrated as the day went on. I was exhausted and starving, having already been up for eight hours, but my work day was just getting started. The rest of the day was going to be tough to get through. For family time, I tried to FaceTime one of my brothers. He ignored my call. I don't live in the same state as anyone in my family, so I had to resort to FaceTime. My twin ignored my call, so I guess I couldn't really have "family time." Dang. I couldn't wait for lunch, but I was also too exhausted to go out and get a healthy meal that Mark Wahlberg would probably eat. Look, I know that the above picture doesn't look very appetizing. I'm sorry! In my defense, the panini actually tasted really good. Maybe I was just hungry, or maybe I was delusional. The world may never know. All I know for sure is that these leftovers were free, and they were already in the fridge, so they were good enough for me. I didn't have any work calls, so I tried FaceTiming one of my other brothers. He ignored my call too. I was beginning to think that my family secretly disowned me. Things were not going well. I chatted with a few people at work to figure out what I could do as a substitute for this one. Someone suggested that I ask any parents at BuzzFeed if I could pick up their own kids from school, but I thought that'd be really weird. Instead, I picked up something that was near and dear to me heart... something that I love just as much as any parent loves their child. I picked up food. I needed to go grocery shopping anyway, so this was actually perfect. Thanks, Mark Wahlberg! I had the rest of my yogurt for my 29th snack of the day. I don't have a pic of it because I was so over the whole thing. Please forgive me. I suddenly got a burst of energy, just in time for my second workout of the day. Mark Wahlberg posts a lot of fitness videos on Instagram, so I tried to copy similar workouts as him for this project. I noticed that he does a lot of elevated push-ups (I'm on the top and he's on the bottom in the above GIF). His second workout of the day only lasts one hour, and I couldn't be more thrilled that it was a shorter workout. I was so close to the end of the day and to my head hitting the cool side of my pillow. I could almost see the light. My body was already exhausted from the first workout and the whole day in general, so a second workout was just torture. I never understood why anyone would do two workouts a day – it just seems like overkill – but obviously it's working for Mark Wahlberg. He's 47 years old and looks great. I hope to look as good as he does when I'm his age. I love food, and I love eating it, but having to portion all of my meals into small snacks throughout the day was awful. I needed to get in my last bit of family time, so I called my mom, and she actually answered! At least one person in my family loves me. The rest of my night was spent with food (a pretty typical dinner for me is sausage with kale) and a movie. It felt so nice to relax in bed, and I couldn't wait to fall asleep. I took great pleasure in turning off all of the alarms on my phone before getting ready for bed, which I did at 6:30. It was really odd to get ready for bed when it was still light outside. I felt like a lab rat in a weird science experiment, waiting for new instructions on what to do. I didn't like it. But then I got back into bed, laid down, and I was able to be comfortable for the first time all day. It was heaven. I ultimately fell asleep around 8:30, which wasn't too far off from Mark Wahlberg's 7:30 bedtime. My body was ready to do absolutely nothing for the next several hours, and I couldn't have been more excited. To be honest, this challenge gave me one of the best night's sleep of my life. I probably slept so well because I knew that I didn't have to wake up at 2:30 a.m. to do the same exact things all over again. It was fantastic. I did wake up twice throughout the night (once around 1 a.m. and another time around 5 a.m.), but I fell back to sleep pretty quickly. I don't understand why Mark Wahlberg doesn't just wake up three hours later and then go to bed three hours later. Like, 5:30 a.m.–10:30 p.m. seems like a much more normal schedule, but I guess that's the point: Mark Wahlberg is not normal, he's superhuman. I think I'd be able to get used to his schedule if I did it for long enough – just like how I eventually got used to my current one – but to be honest I wouldn't want to. If anything, I think the moral of this story is that no one should ever willingly wake up at 2:30 to start their day. Thanks for the fun, ridiculous, and tiring adventure, Mark Wahlberg. Please go take a nap. You deserve it. If you want to follow along with my other weird journeys, you can follow me on Instagram @SpencerAlthouse.